There’s a whole host of workshops and sessions to choose from over the weekend and choosing what to do is all part of the fun. The best news is that there is plenty of pizza to keep you fuelled. There is a whole range of sessions to compliment your attendance at Trail School and here’s some of those that are worth considering. 4pm Navigation Workshop especially for those new to a map and compass. 3pm Stretch and Mobility Workshop. Then onto Saturday and this could be a busy day! 11am WoodRun Technique – Drills into good posture. Stand Tall! 2:30pm Hill Technique, specifically uphill. 5pm How about joining a Led Run, nice and easy does it and relax. Oh yes, eat Pizza and then head towards the evenings talks and film. 11:30am Running with Poles – especially helpful if you are looking at ultra’s. 2:30pm Hill Technique, this time ‘Down’. In that case, it could be the workshops is where it is at for you. Again this leaves plenty of time for a slice of pizza and a catch up before heading into the evenings talks and film. Sunday, let’s start with a morning run… 10:30am head out for 10km on the blue loop. 2pm Running Injuries Talk – what to do to avoid them, well, I think we can all learn something on that topic. 4:30pm Running Q&A Session with our panel of esteemed local runners. Oh and eat pizza, I like pizza! Friday – Let’s go Plogging at 5pm, then straight into Laura’s Strength class at 6pm. Yes, Pizza next. Then it’s Talk Time with Rob Jebb and then we’re off for another run. 10:30am sees you heading out on the Black Route and a led run. 1pm WoodRun and Running Strength will give you some ideas to stay strong. 2:30pm time to get your head in order with the Mental Resilience Workshop… A chance to draw breath too. 4pm Navigation Workshop – there has to be some trail orienteering involved in this. 5:30pm You have enough energy for another run? Blue Loop it is..
Then it’s Pizza time before heading into the evenings talks and film. 10:30am It’s of for another run, 10km this time. 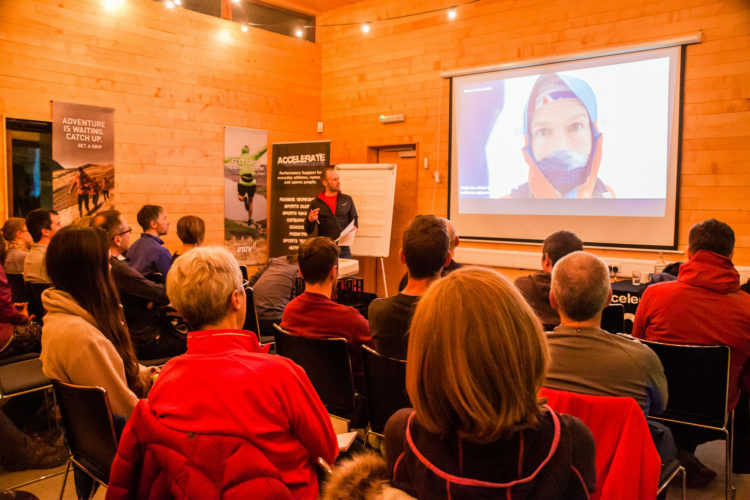 2:30pm Hill Technique session looking at safe and fast downhill running. 4:30pm A chance to get some ideas from our local running ambassadors on all things training and racing. And sleep… after another Pizza, you’ve earned it.